From Nazca we took an overnight bus with CIAL to the UNESCO site of Arequipa for 70 soles each. 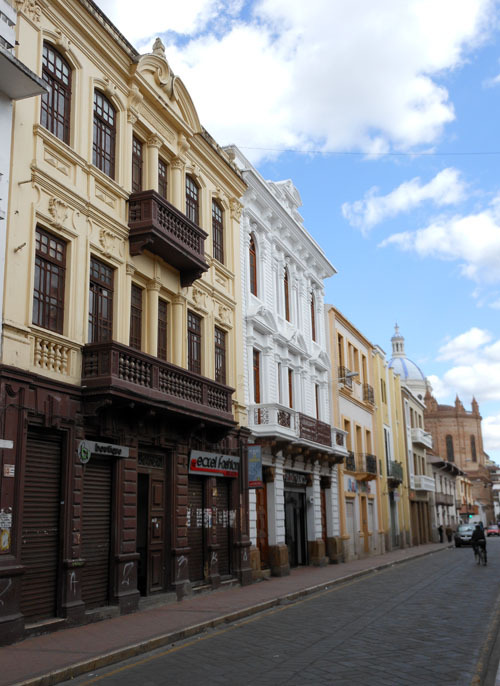 We arrived in Arequipa early the following morning and as usual had nothing booked. So we took a taxi to the Plaza de Armas for 8 soles and went looking around for somewhere to stay. We finally settled on Hostel Santa Catalina located just 5 minutes walk from the Santa Catalina Convent. As we were so close and it was still early we decided to pay the monastery a visit. The entrance is quite steep in terms of an attraction and cost us 35 soles each, however it was definitely money worth spent. Once you go through the gates you enter a different world. It’s like a small town located within the large city of Arequipa! Inside the convent which was closed to the public for over four centuries, you can find cobbled streets, plazas, cloisters, kitchens and much more. The most striking thing about the convent is the colours. Each section has brightly coloured walls from deep blues to bright reds, and all the streets are lined with geraniums and potted plants. It really is an amazing place and you can easily spend an entire afternoon wandering from quarter to quarter. Located about half way through the maze of little rooms and streets there is a tranquil cafe selling drinks and snacks. The rest of our time in Arequipa was spent relaxing in the city. 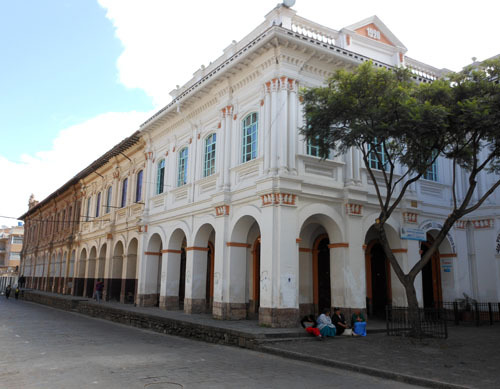 It is a surprisingly pretty place with colonial building, numerous museums and a lovely plaza with the large cathedral with an intricate facade. What makes Arequipa stand out the most is the fact it is surrounded by impressive snow-capped mountains, including El Misti, Chachani and Pichu-Pichu. We had originally wanted to go and visit the Cotahuasi canyon as part of our time in Arequipa, but after speaking with the extremely helpful Peru information point on the main plaza, we realised that it would involve a 12 hour bus journey that would get you there at around 3am. We calculated it would take us more time to get there and back than the time we wanted to stay, so instead we looked at Colca canyon. Plus, apparently there are no condors in Cotahuasi and that was one thing we wanted to see. The day before we were due to leave Arequipa I wasn’t feeling too good so in the end just my partner went on a day trip to Colca. The day trip cost 55 soles plus an entry fee of 70 soles to the actual town. The tour started with a stop at the view-point of Patapampa, from where you can see the Hualcahulca, Sabancaya and Ampato volcanoes. The tour then continued onwards to Cruz del Condor with a couple of more stops along the way. Once at the Cruz del Condor he had 45 minutes to walk around and take pictures, and he was lucky enough to see several condors in flight. 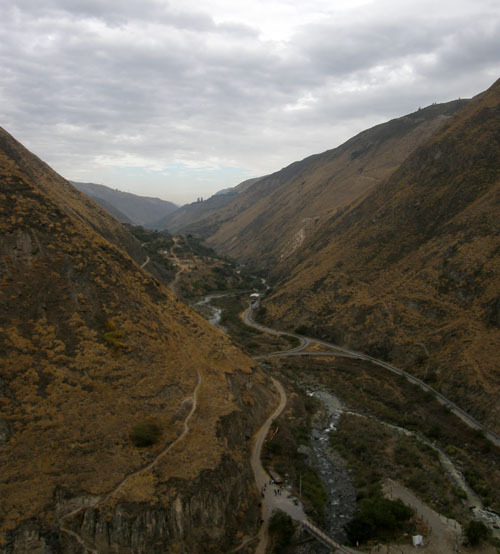 Once the condor watching was over the tour headed back, with a pit-stop at Maca for views of the Colca canyon. After lunch the tour headed to Vizcachani to spot local animals including Alpacas and Llamas. Unfortunately, the hot springs part of the tour was missed out due to a couple of tour members needing to get back in time for a bus connection. All-in-all he enjoyed the tour and thought it was worth the money. Once he got back we headed straight out to the bus station to catch our overnight bus to Cuzco. From Huacachina we took a taxi back to Ica to catch a bus with Soyuz to Nazca; the tickets were 12 soles each and the ride was 3 hours. As I had missed out on seeing the Nazca lines when I was in Peru back in 2008, I was determined to now incorporate them into our trip. We arrived in the town of Nazca at around 11am and headed of to the Inti Wuasi hostel, which we had chosen ahead of arriving. The hostel though turned out to be just ok, it is still being constructed and the place does not live up to the leaflets. However, we were tired and the location worked for us so we stayed the night. Upon checking in we were offered a flight of the lines for the same day, but the price was too high for us. So after about 20 minutes of going backwards and forwards with the price we settled on $100 each with a discount on the room too. We hurriedly got some food and were picked up within half an hour and taken to the airport. There, we paid our tickets and airport tax of 25 soles each and waited for a further half an hour to take the flight. One thing we noticed about the airport was that there were several flight companies there, we are not sure if it would have been cheaper to go directly to the airport and haggle for a flight but as we wanted to move on the next day we took the easy route this time round. At 1pm we boarded a small 4 seater plane. Note that prices are tier based, the smaller the aircraft the higher the price as it flies lower for better views, so always make sure you check which aircraft it will be. If you take the higher flight you will probably struggle to see the smaller lines. The flight lasts for around 30 minutes and it does not matter which side you sit on as the plane does a loop around each set of lines. The plus side is everyone gets a good view, the down side is if you suffer from motion sickness it will kill you, as it did me. In total there are 14 sets of lines to see in varying sizes, but unfortunately I only made it as far as number 5 – 6 before my motion sickness claimed me. Luckily, they are used to this and provide bags for such incidents. One thing that made it worse was the heat. We were flying at 1pm and the aircraft was very hot, so that mixed with the constant twists and turns really got the better of me! If you suffer badly from motion sickness it may be worth going to the viewing platforms instead. It may not be as great as you only see a set or two but at least you wont get ill.
From Pisco we decided to go and visit the oasis of Huacachina, located next door to Ica. We took a bus with Soyuz for 4 soles each and an hour later we arrived in the city of Ica. From the bus terminal we jumped into a taxi for 7 soles and were in Huacachina less than 10 minutes later. We had been referred to the Salvatierra hostel and after taking a quick look we checked in for the night. We then headed out to take a look the oasis. Unfortunately, we were not overly impressed with what we saw. We knew it was going to be small, but we had not expected it to be that small! There is basically one road around the very small lake where most of the accommodation and restaurants can be found. From here there are literally a couple of small side roads and that’s it. The whole thing is pretty as it is surrounded by huge sand dunes, but to the say the lake area is a “summer resort” is really pushing it. Another thing that hit is how unclean the lake area is, we saw bottles floating in the water and the old changing room area is littered and smells. On the plus side, if you climb the dunes you get views across the desert and if you make it up to the top for sunset you can experience the sun setting over the oasis and surrounding sand dunes, which is really pretty. We stayed the night as we had already paid but to be honest the whole thing can be done in a couple of hours, including a lunch. There are 2 activities that you can do in Huacachina, sand boarding and taking a ride in a dune buggy. Again you could easily incorporate these activities as a day trip. We had originally planned to head straight to Peru after our week in the Galapagos Islands, but on a last-minute whim we changed our minds and decided to go whale watching first. We had met a couple of people during our travels who had suggested Puerto Lopez as a prime viewing area, and with the whale season running from June until the end of September we hoped to have a good chance at a sighting. Our flight from Baltra landed at Guayaquil airport a little after 3pm and we headed straight out to the bus terminal, located a short 10 minutes’ walk away. Luckily we were able to catch the last bus going out at 4.30pm. At 8.30pm we finally arrived on the main road in Puerto Lopez with no idea as to where to go next. For the first time in my life I was actually grateful to the street hagglers you get when you get off a bus. After a quick chat with a tuk-tuk driver we were off to look for hostels. The deal was we could look at 3 places for a $1, fair price we thought. In the end we settled on Plaza Real, just 2 blocks from the beach. The same evening we managed to book ourselves for the 2 hour whale watching tour the following morning. After negotiating we managed to get the tour for $15 per person. The tour basically consisted of driving around the bay in a small yacht looking for whales. From the launch off point on the beach you can see the numerous tour boats all heading out. For the first hour we didn’t see anything and were starting to feel like we might end up not seeing any whales. Then as we changed course we suddenly started to see them, at first just surfacing out of the water, but then to our amazement one jumped out of the water! It was a truly amazing experience and we were glad we took the detour. Puerto Lopez itself also turned out to be a nice place to relax, with restaurants and bars along the beach and at reasonable prices too. And at night the whole beach would come to life with bars playing music and selling cocktails. Puerto Lopez turned out to be a great little place to spend a couple of days eating good food and enjoying a beach nightlife, and we were glad of the last minute detour. Before our marathon week in Galapagos we wanted to settle down somewhere for a few days and just relax. We had planned to do this in Banos, but after 2 nights there we quickly decided it wasn’t the place for us and so we moved onwards taking in an overnight stay at Alausi for the Devil’s Nose train ride. 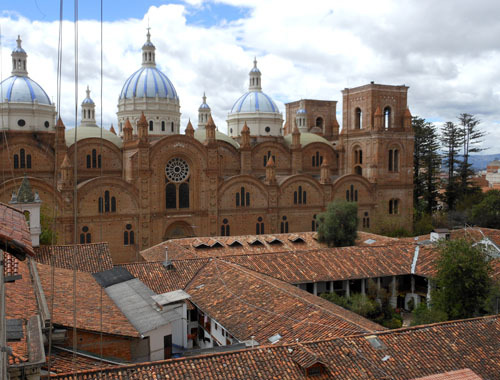 And so we arrived at Cuenca, described as a UNESCO city filled with pretty buildings and streets. Big enough to give you plenty to explore, yet small enough to not feel like you are in a huge city. We had pre-booked ourselves into the Hostel el Monasterio, overlooking the beautiful old cathedral and after arrival decided to stay for 5 nights. 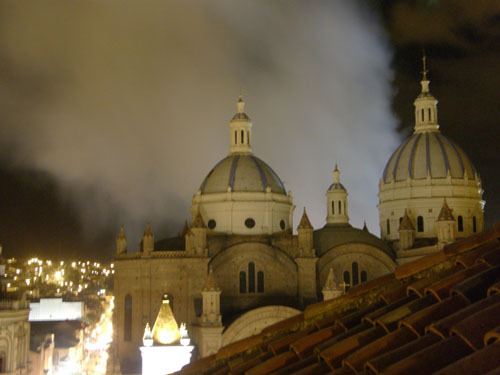 The hostel is conveniently located to take in the 2 cathedrals of Cuenca, the historic centre and the nearby food market. Perfect for us! Despite wanting to get away from it for a few days our first night at the hostel unfolded into a bit of a drama. It was one of the churches feast day and as such there were processions in the evening followed by fireworks. However, we noticed that this abruptly ended and we started to smell smoke. Looking out from our bedroom window we could see smoke coming from the front of the old cathedral and hurried round to the balcony at the front of the hostel for a better look. What transcribed were several hours of dozens of fire-fighters trying to put the fire out. At first we weren’t sure if it was the actual cathedral that was on fire or not, but we later learned that luckily the fire was in a building opposite the old cathedral. However, despite the fire-fighters best effort the monastery behind the cathedral did not come off unscathed and suffered some damage on some of its side buildings. The cause of fire was apparently due to a dodgy firework which had not properly exploded when it took off. Sadly, the buildings that caught fire were of colonial heritage and invariably caused a loss to the city. The rest of our time in Cuenca went by without any more dramas, we were able to go for walks around the city, relax at the hostel and shop at the local market for fruit and vegetables. One thing we noticed about Cuenca was the array of health shops and the large variety of vegetarian supplies, including frozen soya meat products. Something we had not encountered in other countries so, needless to say, we had a feast of good food during our stay! The one thing we didn’t get round to doing was to go and pay the nearby thermal pools a visit. Apparently, they are located a 30 minutes bus ride away and have varying price ranges from spa to free pools. Once our rest time had come to an end we took a 5 hour bus ride to Guayaquil, we didn’t want to spend long here and so arrived in the afternoon with the intention of just staying night before our flight to Galapagos. We have officially been travelling for over 6 months now and I am still amazed by how many people we meet along the way who seem to think that we are just on an extended holiday, rather than a new life style. Don’t get me wrong, travelling is definitely better than working 9-5 Monday to Friday and running around all week trying to ensure you have everything done on time, to ensure yourself some rest time on the all too short weekends. However, one thing people don’t seem to realise is that travelling is not just something you decide to do to see places. It actually takes a lot more dedication and planning to pull it off. I’m not just talking about the preparation that is involved in a long-term travel, which believe me is a lot, but the actual day-to-day living. There are many aspects to travelling that people don’t think about, such as the daily management of a limited pot of cash with no top-up options! When you are on holiday you can afford to take out your credit card and add a treat, knowing you can pay it off with next month’s salary. However, when you travel you have to be aware of all your outgoings and sometimes that means knowing when to rein it in. For example, cooking saves us money which allows us to travel for longer. Another thing is learning the art of bargaining, sometimes even saving just $5 on accommodation can mean eating out instead of cooking every day. The key aspect though is that something has to actually switch in your mind to be able to travel. We noticed that the first 3 months we were basically “holidaying,” we were in the country with an itinerary and we kept thinking about home and comparing things to other trips. Not only this but our attitude was somewhat different, we were not quite embracing each place, but more passing through them. At the 3-4 months stage we started to really feel like it was taking its toll on us, we even started to think about maybe taking a break. We felt tired with the constant moving, the unpacking and re-packing and the always thinking ahead to the next place. We were basically burning out. Towards the 5th month we noticed another change, we finally let go of the expectations of travelling and started to think about only where we were. We stopped planning about the next place and worrying about what we would do and where we would sleep. We stopped thinking we had to fit everything in, just because we were lucky enough to be here travelling. We still had a vague idea but we weren’t chained down by the thoughts and as such, we started to feel more free in ourselves and embraced where we were. The biggest change was we stopped thinking about what to do next and simply enjoyed what we were doing at the time. We finally started to travel and live on a day-to-day basis. Travelling has now turned into a new lifestyle, similarly to when you start a new job, and you spend the first few months feeling your way round the place before you start to feel part of it and settle down to your new role. Travelling is no longer about cramming things in to see or places to be but rather enjoying the daily activities or lack of if we so decide. The pace in our minds has finally slowed to be able to embrace travelling and not just be on an extended “holiday”. Although we do not tend to think about what will happen when our money runs out, it has left me wondering how we would ever adjust to a “modern” lifestyle again, or simply if we would want to. Ever since I first saw the Devil’s Nose train ride on television as a child I have wanted to ride the train. 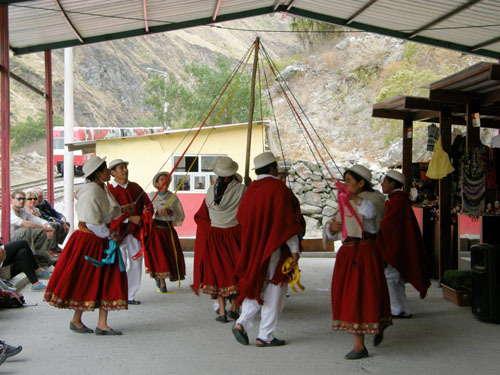 Therefore, from Banos we decided to take a slight detour on our way to Cuenca, and pay the town of Alausi a visit. 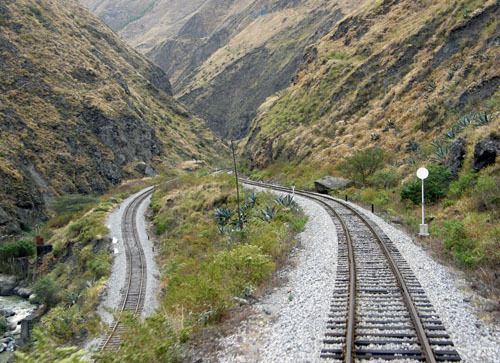 Finding information on the Devil’s Nose train ride, or any other train line in Ecuador can be quite a task as information seems to constantly change. 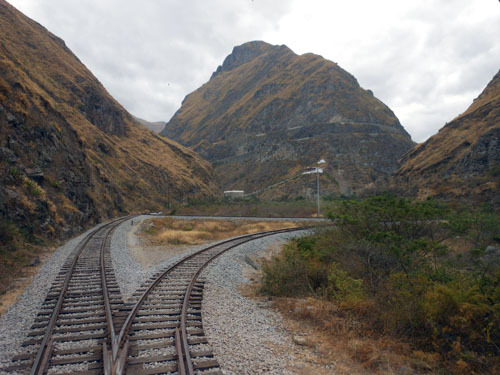 Luckily, our guide in Quilotoa referred us to the Ecuadorian train website – www.trenecuador.com. On the website you will find information on prices, timetable and routes for all the parts of the still active train rail system. It is worth noting that a great deal of work is being undertaken to reunite the sections of the rail, and I expect that in the next couple of years a lot of the rail system will be back up and running again. We arrived in Alausi at 2pm hoping to take the 3pm train ride, we found a lovely new hostel on the main road called Hostal Estacion del Tren, checked ourselves in, dropped off our bags and headed for the station. Unfortunately, they were fully booked for the afternoon but we were able to buy tickets for the following morning. The only downside was that the good seats with the view, on the right hand side of the train, were fully booked except for in first class, which would cost $35 each. It was steep but I had waited so long to take the ride that I didn’t hesitate for too long. With our tickets booked we headed back to get something to eat. The following morning we were at the station at 7.45am for our 8am train ride. The first class area consists of a horseshoe-shaped couch so you can maximise your views. 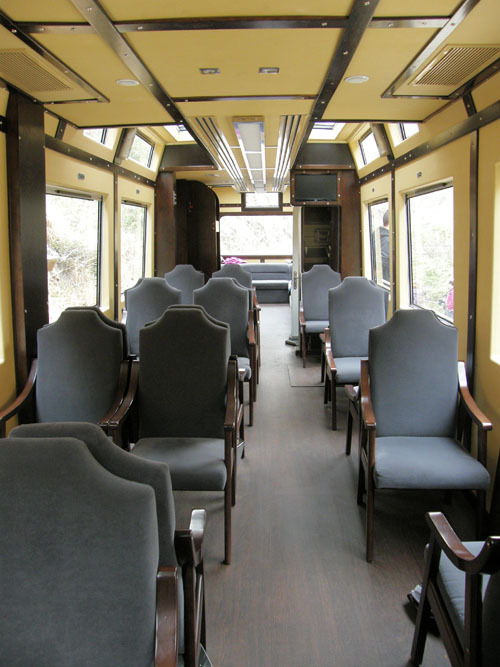 The whole train has windows on the sides and part of the roof so you can really see around you. 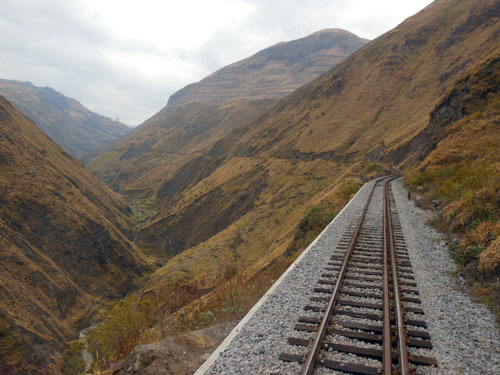 The ride took just over an hour to reach the station of Sibamba, going through the famous switch back rails, enabling the train to descend comfortably. The views of the surrounding mountains and scenery is beautiful and the train goes fairly slow to allow you to take it all in. At the station we were greeted by locals performing a welcome dance, a tour of the museum and a courtesy light lunch and drink before heading back up for another ride through the switch back system. Although, the train ride is much more tourist orientated than the one I saw all those years ago, it was still a fun experience and definitely something different. Originally we had wanted to take the weekend train, which supposedly is the “local” train but our days did not coincide, so if you are considering doing the train ride it may be worth seeing if you can take the weekend train instead as it is also a fair bit cheaper!